I don´t like molds. Well, maybe for cooking. In the process of growing up, the only thing I have been really doing is throwing away stuff. Because, the only thing I have realized is that all those things I assumed have a define shape (happiness, relationships, success, spirituality, yoga, etc.) well, in the practical-real-alive life, don´t fit with any type of preconceived mold. The process of throwing away stuff is nice and deep and I like to think that has to do a lot with vairagya, Patañjali´s non-attachment (I.15). I have a mental idea of what happiness is. I have read about it, I have seen it on TV. Everyone around: my parents, my friends, my teachers, everyone, seem to be very into it so, OK, let´s go there! Then, in my mind, a creative process begins where happiness starts to be connected with other stuff; happiness is colorful (some specific colors not black, oh no), has some temperature (spring-summer temperature), happiness has to do with some people around me and, I can even listen the happiness soundtrack playing. The thing is that in the practical-real-alive life what happens is more related to what “The Tibetan book of the Dead” says: “wishing for happiness, we pass our human lives in suffering”. Patañjali also talks about suffering (II.4). He says that the cause of suffering is avidya, ignorance, delusion. Well, let´s say it: Creating a stable pattern for something that it´s clearly in constant transformation and movement, have to be ignorance. Once, I read in Alejandro Jodorowsky´s “La via del Tarot”, that perfection is dead. In perfection nothing-nothing can change because if that happens, there is no perfection any more and well, when nothing can change we are in front of something weirdest than death itself (because changes continue even after death). The thing I wanted to write about was that I like this feeling of throwing away mental structures that are here creating pain and discomfort. Before: When something didn´t fit in my mold my first reaction always was something like: But, come on! You have to fit here, this IS love, success, happiness, friendships, yoga, etc. (The list is endless) And there I was, fighting against something bigger than me, feeling bad. For the last years now, I have been asking myself: Why do I want the things to be different from what they are? Will it change the way I feel love, the way I feel happiness? Maybe the form will change, but not the content. Maybe, if the form change, the content also suffers some changes. Maybe the key is to be open. I am now practicing seeing things as “they are” without putting my preconceptions on them. I am practicing to not interrupt the others in the way they share their own feelings and I am feeling light. No, I am not arranging my molds on the side; I am throwing the stuff away from me. Creating space. I am letting happiness find me. I am allowing love be. Nice post! I always wonder if that kind of thought doesn’t really mean indifference or simply inertia. (I mean, that central question: why do I want the things to be different from what they are?). 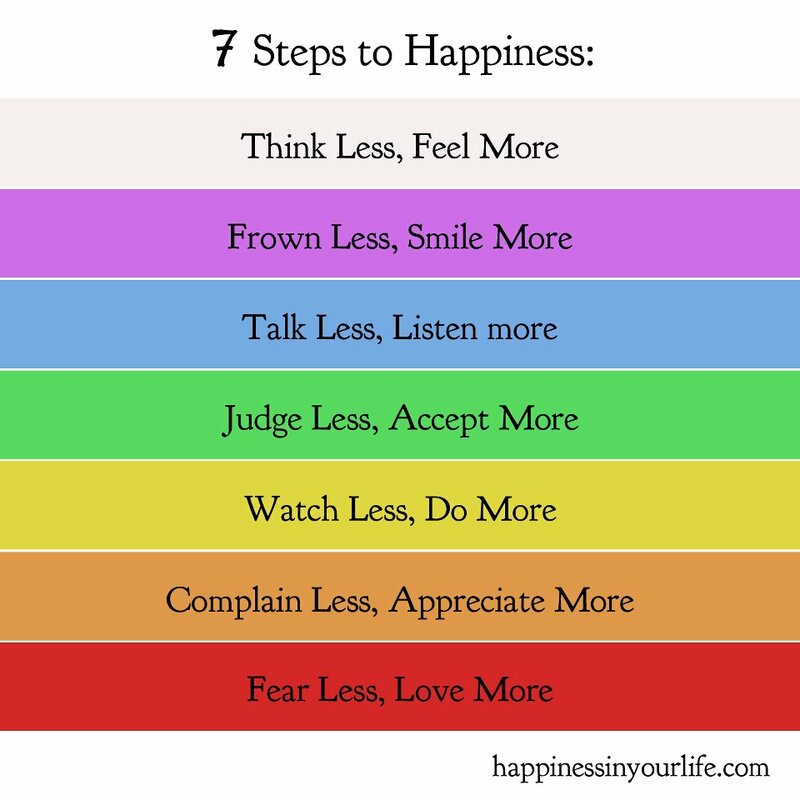 I like the diagram of “7 steps to happyness”, it is soooo true! Leo, I don´t know, maybe it´s inertia if you are buying something and you expect good service and it doesn`t come. Maybe not. I was thinking more in a practical way. In the article you posted, they say that happiness has to do with your expectations, the less expectations you have, the happier you are because there is more chance for you to get a “good life service”. Is that indifference? I don´t know. I guess it´s good to have in mind that things have different meaning depending on the person. Music means something to you that it´s completely different to what it means to me. That´s why I´m not sure to call it inertia. I am sure everyone will stand up for the things they feel important, the tricky part, I think, it´s to find those things inside of you and not try to “have them” only because society, your family or friends, told you they were important.